With his old enemy the Master safely locked away, the Doctor is able to relax a little and pursue some experiments. His valued assistant Jo Grant is quite willing to provide her very human perspective. By accident, the Doctor and Jo witness two counterparts of themselves from some point in the near future. Meanwhile at Auderly house, Sir Reginald Styles is busy preparing for his much anticipated role in a pivotal peace conference. During one night he is suddenly disturbed by a man in military attire with a weapon of futuristic design. But before the killing shot can be made, the intruder vanishes into thin air. Some time later, other guerrillas attack the house but instead find a terrified Jo and a remarkably laid-back Doctor. They commandeer the house; preparing to finish their mission upon Styles' return. Despite their aggressive manner, the Doctor explains to Jo that there must be a proper motive behind their actions. The fighters come from future Earth, and their time-jumps have been noticed by their enemies, who subject the majority of mankind to slave work in mines or factories. The 'Controller' of this section of Earth barks orders at powerful brutes known as Ogrons. Soon a squad of the semi-simian creatures are sent back to the past to stop the resistance from succeeding. But behind the Controller and the Ogrons lies a more significant foe, and one the Doctor thought he had extinguished for good: the Daleks! After one of the definitive Pertwee serials, The Daemons, which saw UNIT showcased in charming and impressive fashion, Season 9 was a definite come-down for this component of Who lore. The Sea Devils had a terrific outing for the Royal Navy, which was extra special due to much real life facilities on loan. The two adventures in 'outer space' had barely any mention or use of UNIT. The season opener and closers, whilst at first glance having the Doctor's allies involved in the plot, merely required them as window dressing when it came to the essential nuts and bolts of the story proper. Day's heart and soul lies in the future Earth, and the circumstances in 20th Century time that led to its creation. The morality issues, and personalities of the human resistance was done very well in the original TV story. Here, Terrance Dicks does great work in breathing further life into Monia, Anat, Shura, and a number of more minor fighters. More explanation of the undercover work, and fear that comes trying to go against the all-mighty establishment the Daleks have put in place, makes this one of the most powerful and emotive of all the Classic Series novelisations to hit bookstores over the decades. But in terms of how well this works as an actual Dalek story, there are problems. Much of the time the Daleks are hiding or demanding that their minions "exterminate" the resistance and/or the Doctor. The catchphrase the Daleks use was actually sparingly featured in their dialogue during the black and white days of the show. This story sadly saw this frequency change just a little too much. And even with Dicks' fine use of universe building concepts - such as a wider Dalek Empire gripping much of the galaxy - they still fare rather weakly. Only in the final sections, do they take matters into their own protuberances. Yet even at the climax, they all blunder into Auderly House assuming that their invasion path has not impacted on the location of those they intend to murder. The other monsters that feature are the Ogrons, who are a race of brutal mercenaries. Whilst lacking basic intelligence they were dependably loyal and far stronger in hand to hand combat than even the toughest human resistance fighter. One of the best monsters to originate in the Pertwee era, they were utilised again in Frontier In Space. Dicks does well to emphasise the contrasting mental and physical qualities of these alien beings. As in The Claws Of Axos audiobook (released earlier this year) Richard Franklin is a solid and committed performer, for this production of a top-notch novelisation. With more material for Jo in this particular story he produces a charming imitation of the memorable Katy Manning. Benton has a heavily exaggerated accent compared to the John Levene original, but regardless he has always been, and will always remain a likeable, and relatable character. There is a little bit of amusing material for Captain Yates himself in this adventure, but he barely plays a role in the final episode. The Third Doctor, with heavy lisp and superior manner, makes for the most imposing figure of the audiobook. He is showcased in tremendous fashion, being warm, dismissive, domineering, light-hearted, outraged, and gung-ho depending on where in the story's proceedings he finds himself in. Day Of The Daleks, whilst hardly a flawless classic, has been a personal favourite of mine, for many years. 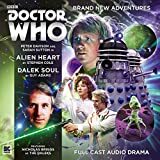 It has intriguing ethics, plenty of action, character development for hero and villain alike, and was in the heart of a period of Doctor Who where the show reached unprecedented levels of success in production and audience reception. This release is most welcome and rewards the extra time needed to listen to the narrative, as opposed to the four fleet foot episodes of the television screen format.